Kubb Cymru - the Welsh Kubb Association - are holding the inaugural Kubb Cymru Championship at Rodney Parade on Sat, July 16. Read More and Register. Officially called Kubb (our 'Game of Throwns') is a fun lawn game, as played (apparently) by the Vikings. Find out more about the game of throwns. "Absolutely awesome, added a great interest to our festival! Fun for all game. Spectacular giant loved by all & superb team to work with! Thanks guys we can't wait to have you back to Beacon Festival"
"Having worked with King Kubb at many different festivals & events this year I have found that they are always a crowd pleaser. 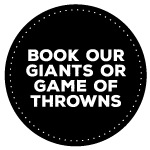 The historically accurate 'Game of Thrones' gets families, work mates, adults & kids excited and eager to play again and again..."
"What an excellent way of bringing people together! King Kubb went down a storm for us at Green Man 2013. I loved the way people watching really got into it and teamed up to play even when they didn't know each other. It brought out the best festival spirit in everyone. Excellent!" "The real centrepieces are the giants. So effective and lifelike they are a real draw to any event. Perfect to lead a parade, lights switch-on or canival, the Kubb giants really make the event stand out...Working with Barney and the rest of the Kubb crew has been a pleasure this year. They come equipped for any eventuality, are a self-contained unit and clean up after themselves. A true professional outfit." Kubb, or Viking Chess has its origins in Scandinavia, and is a fun and competetive lawn game. The object of the game is to knock down your opponents wooden blocks — the kubbs — by throwing wooden batons at them. The pitch is a rectangle, 8 metres by 5 metres with the kubbs placed on each opposite baseline, and a king in the middle of the pitch. Rules can vary from country to country (or even region to region) and games can last between 5 minutes and an hour (if playing the longform game… which we don't). When one player has knocked down all his opponents kubb then they get to aim to knock over the king to win. It is a fun game for all ages and abilities — we can shrink the court for younger players, or players with disabilities, and from our position as fathers it has the added benefit of getting the kids away from their screens (and doesn't require charging, wifi or a 3g signal!). King Kubb tours the festivals of the UK in the summer months, but we are also available for your private events. Thanks to Justin Ross for this video (we'll be making our own soon!). The Ancient Viking Game of Kubb is hugely enjoyable and is guaranteed fun for all ages and abilities. Opposing teams pit their skills against eachother across a court to capture the king. The Rules should only take a few minutes to learn but could take a lifetime to master. Kubb will test your hand-eye coordination, strategic thinking and your luck! The Ancient Viking Game was said to have started in the 9th century in Sweden. Luckily the game is no longer only played by bloodthirsty marauding warriors, it has found worldwide popularity. Whilst many people play purely for fun, there are competitive leagues in many countries and an annual world championship in Gotland, Sweden. We've held several Kubb Kups over the past couple of years, notably at Green Man Festival, The Welsh Cider & Perry Festival (Caldicot), Green Gathering festival, Blue Lagoon, Beaconfest, Lakefest and Croissant Neuf Festival. The competition is open to all comers, and structured like a traditional knockout cup. The winners and losing finalists all receive awards, and prizes, and we're aiming to grow this aspect of our business to launch the Welsh Kubb Knockout Cup... stay tuned!